November 19, 2018. 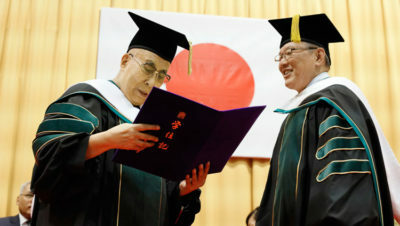 Tokyo, Japan – His Holiness the Dalai Lama ventured into Chiba Prefecture again today when he drove out of Tokyo to Kashiwa and the Reitaku University. Trees in the delightful campus presented an array of autumn colours and lining the driveway to the Reitaku Memorial Hall were several hundred students and staff smiling and waving Tibetan flags. His Holiness was received by University President Mototaka Hiroike and Vice-president Osamu Nakayama who escorted him into the building. When he stepped onto the stage he was met with an outburst of warm applause from the more than 1700 strong audience. In his introductory speech, the President thanked His Holiness for his work to promote warm-heartedness and inner values as the source of human happiness, goals shared by the university. 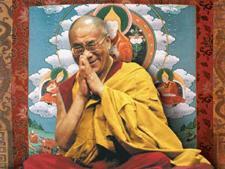 He also acknowledged His Holiness’s efforts to reach an understanding between modern science and Buddhist science. “I’m simply a human being and every day the news tells us about human beings killing other human beings and innocent children dying of starvation or for want of medical supplies and facilities. We may ask ourselves what’s going wrong since scientists assure us that basic human nature is compassionate. When children are born they receive tremendous affection from their mothers who nurture them with love and attention. We are social animals; we depend on others for our very survival. Kindness and affection bring us together—anger drives us apart. Indeed, scientists tell us that constant anger undermines our immune system and spoils our healt. “Therefore, it’s very sad to see how much suffering in the world is of our own making. Natural disasters are beyond our control, but the gap between rich and poor is a result of human neglect. It’s because too often we think first of ourselves. Modern education is oriented towards material goals with little scope for inner values. When modern education began to emerge about 200 years ago religious institutions ensured a sense of inner values, but as the influence of those institutions has declined we need our education establishments to take responsibility for fostering values like compassion and concern for others. “You young people here belong to the 21st century. I and many of your professors belong to the 20th century and our time has gone. The past is past and can’t be changed, but the shape of the future is in your hands. You who belong to the present century can create a world that will be happier and more peaceful. The last century was a period of immense violence. You Japanese sustained two nuclear attacks during which more than 100,000 were killed instantly—very sad. But in the late 20th century as people became more mature they began express how fed up they were with violence. Answering students’ questions, His Holiness told them his favourite Japanese food is sticky rice, but that he doesn’t like raw fish. When faced with suffering and problems he tries to look at them from a wider perspective. What looks insuperable close up can seem more manageable from a distance. He recommended that young people pay more attention to inner values and the means to achieve peace of mind. One of the ways to set the mind at ease is to remember the oneness of humanity. Asked how it felt to be awarded the Nobel Peace Prize, His Holiness recounted what he told journalists in North America on the day of the announcement. He felt it was recognition of his efforts to promote peace of mind as well as peace in the world. He recalled that when he reached India journalists asked him how he would use the prize money. He explained that he had been so impressed by the positive atmosphere of Baba Amte’s leprosarium that he intended to donate half there; the other half he would give to launching the Foundation for Universal Responsibility in Delhi. Regarding relations with China, His Holiness recalled, “In the 7th century, during the Tang dynasty, the Tibetan king married a Chinese princess. Relations were close. One of the most revered statues in Lhasa came from the Tang capital of Xi’an. We’ve had good relations, we admire Chinese culture, and at some times we’ve fought. When the Tibetan army reached the walls of Xi’an, the Chinese Emperor had to escape.